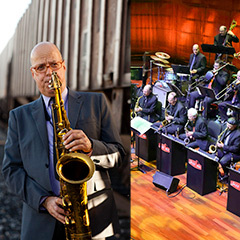 Join Artistic Director Doug Snapp and the JazzMN Orchestra for this very special evening to commemorate JazzMN’s 20 years of bringing professional jazz concert performances to the Twin Cities. World-Class Jazz Orchestra on the Chanhassen Dinner Theatres Main Stage! CBS Minnesota (WCCO) said, “This is pure jazz in all its glory.” Jazz reviewer Pamela Espeland described a JazzMN performance as “…exciting. All those musicians, swinging hard. Horns blaring. Hot solos. And the sound, you feel it on your skin and in your bones.” The JazzMN Orchestra, led by artistic director Doug Snapp, features Twin Cities jazz heavyweights such as Dave Karr, Pete Whitman, Mary Louise Knutson and Joe Pulice. Every time JazzMN performs at CDT it sells out. Don’t miss this rare opportunity to hear Minnesota’s premiere big band live on stage at Chanhassen Dinner Theatres.